3 Tax Audit Tips Every Business Owner Should Know Before Ever Being Audited! So here are 3 Tax Audit tips that you should know before ever being audited. They won’t prevent you from being audited, but they will make your tax audit go as smoothly as possible. Depending on your accountant’s process, they perform a rough audit of your books. Some will just scan to see if things are in the right place, some will take your word for it. Ask them to take a deeper look at your books to make sure everything looks good. If you’re comfortable, you can ask a friend to audit your books once a year – just to look for anything out of the ordinary. Of course, this is all just a quick scan of things checking for errors. An audit from the government will be more thorough. In the last two articles, I’ve talked about the value of being consistent. This is where it’s VERY important. If you’ve made an error but you can show that you thought it was supposed to be that way (“let me show you that I’ve been doing it that way the whole time”) they may be more lenient should they find a mistake. If you’re not paying your taxes and you try that, it’s not going to work. In fact, it may not work at all. But it has worked for me in the past for penalty and interest reductions. The more organized you are with your books and receipts, the less stressful the audit process will be. Being able to locate everything you need with ease will save you from hours of looking for everything they are asking for. 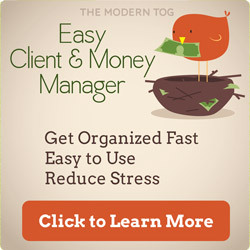 If you don’t already have a great all-in-one system for keeping track of your money and clients, I highly recommend purchasing the Easy Client & Money Manager. It’s an easy-to-use Excel workbook that organizes your money & client workflow in one convenient place. Jamie & I created this photography accounting workbook to help you keep organized, and that will help reduce stress both at tax time as well as if you’re ever audited. You can learn more and buy your own copy by clicking here. ACK! I’m about to be audited, now what? If you receive a letter from your state or national government (in the US it’s the IRS) make sure to read it carefully and follow the instructions. Not responding on time is a sure way to make things difficult and extra stressful during an audit. 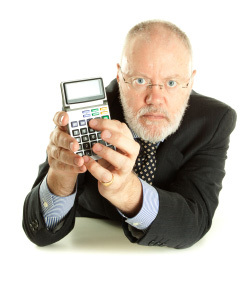 You’ll want to call your accountant and let them know. They will probably have some good words of advice for you, since they’ll already be familiar with your business and finances. Be friendly & polite. I’ve had the fortune of going through three audits with past employers (a Wisconsin State tax audit and two Federal tax audits). Every time I had helpful and friendly agents working with me. Give them the benefit of the doubt and be friendly from the start. Don’t be defensive, as you should have nothing to hide. At the same time, be brief and only provide what they are asking for. They often are looking at specific items and will ask for those. Don’t worry about the rest. They often ask to meet at your place of business. You can request that you meet them at their office (especially if you work from home). Depending on the type of audit and how long they will be there, they may still choose to come out to your place. More than likely, they will find a mistake. But it’s ok. Why? I know that sounds strange but it is a very important thing to remember because sometimes we forget that it’s not everything. If you are doing your books consistently and regularly, if you keep good financial records, and if you are working with a professional accountant to make sure you are on the straight-and-narrow, you will be fine. Just remember, if they find $100 out of place here or there and you have to pay something: It’s only money. You would have had to pay it in the first place, right? Don’t let frustration or fear drive you. Spend that energy on projects that make you money instead! How ready do you think you’d be if you were audited today? Leave a comment below and share!